Our first product, invitbox, was the world’s first cloud-based data extraction suite and approvals process for supplier bills. We won XERO’s Emerging Add-on Partner in Australia for 2013, and we also integrate with Intuit’s QuickBooks, MYOB, Saasu, NetSuite, Reckon and many more accountancy software suites. 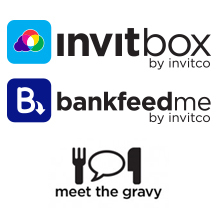 In 2014, Bank Feed Me will offer a SaaS solution to extract data from bank statements.